Regionstog is a company which is a fusion product of several earlier private rail companies. This "rubbernose" of class IC2 is seen here at Nyk�bing 11.7.2013 ready to leave towards Nakskov on the so called Lollandsbanen. State railways DSB has also a train called IC2, but that is a totally different one. Picture by Ilkka Siissalo. 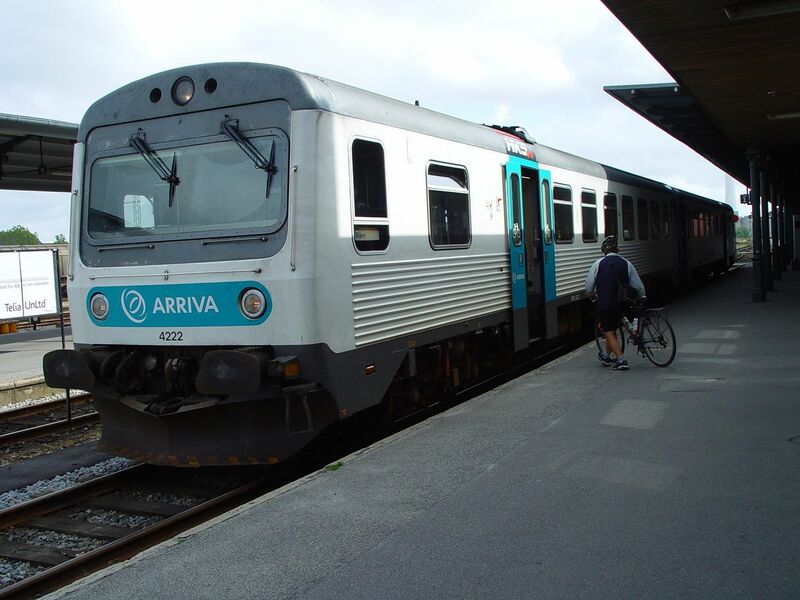 Arriva is originally a British company, which won in public tenderings some of the local and regional train routes in Jutland. 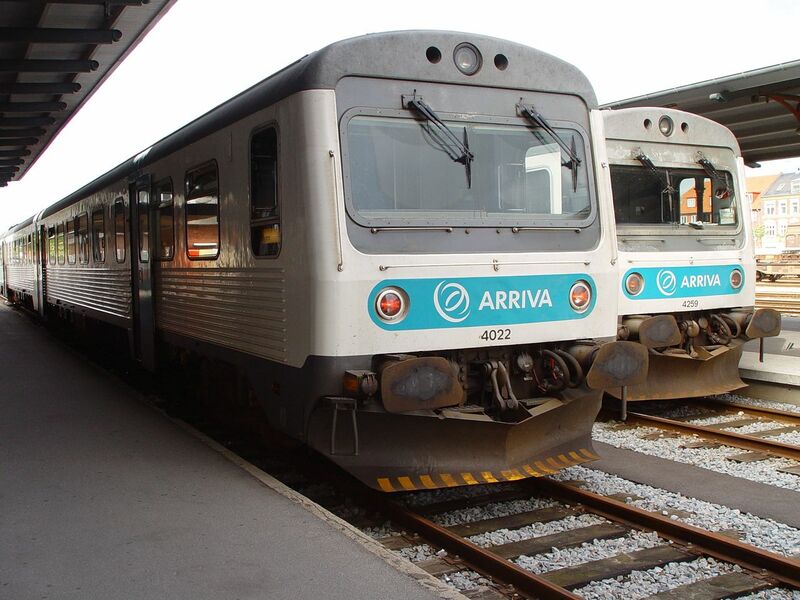 Originally Arriva rented old railbuses from DSB, but proceeded then to buy new rolling stock. 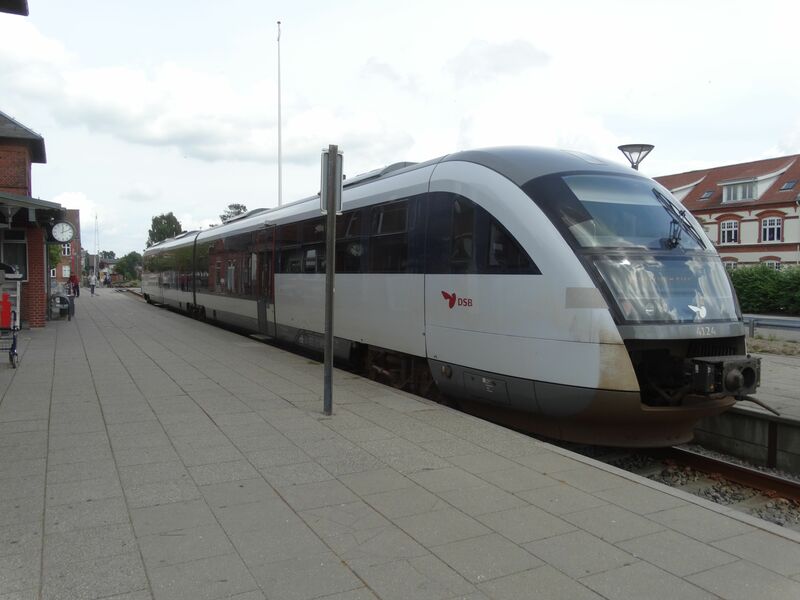 Today most of Arriva's traffic in Denmark is run by these Alstom made trains of the type Lint. 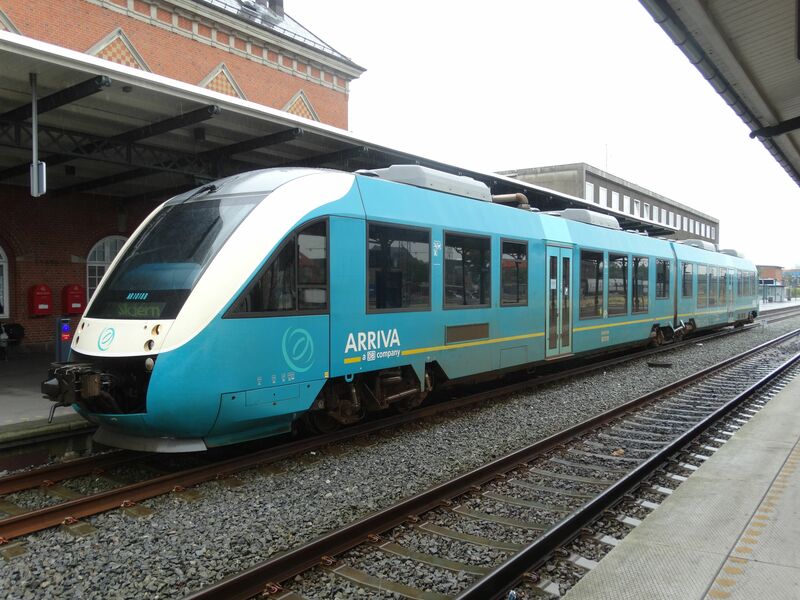 Arriva has for some years now been a daughter company of the German DB, but according to reports in the summer of 2016, DB is planning to divest and sell the company. Picture at Esbjerg station 8.7.2016 by Ilkka Siissalo. Another view of an Arriva Lint at Esbjerg station 8.7.2016. Picture by Ilkka Siissalo. 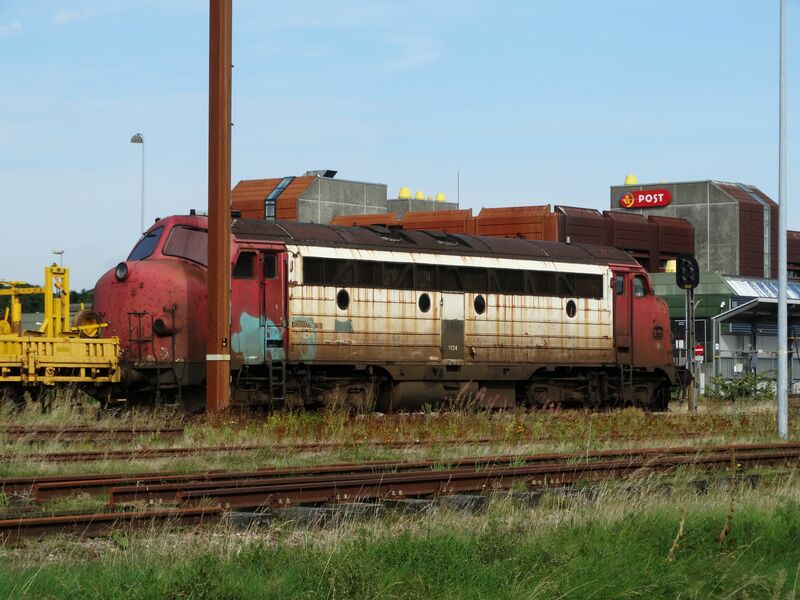 This picture is from those times when the company Arriva had fairly recently arrived in Denmark and was still operating with old class MRD diesel railbuses rented from DSB. Picture in Esbjerg 3.7.2004 by Ilkka Siissalo. The old class MRDs were not very comfortable for bikers. Picture in Esbjerg 3.7.2004 by Ilkka Siissalo. Banestyrelsen is not really exactly a private rail company, but rather the state authority that takes care of railroad maintenance and ownership in Denmark. 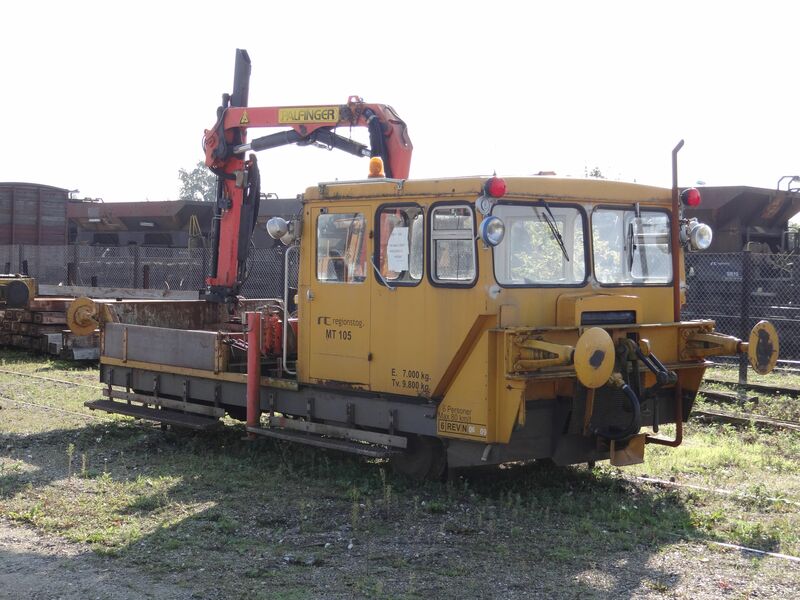 This little cute rail truck was photographed 2.3.2003 at Nyk�bing station by Ilkka Siissalo. Note the small rotating brushes used to clean tracks. 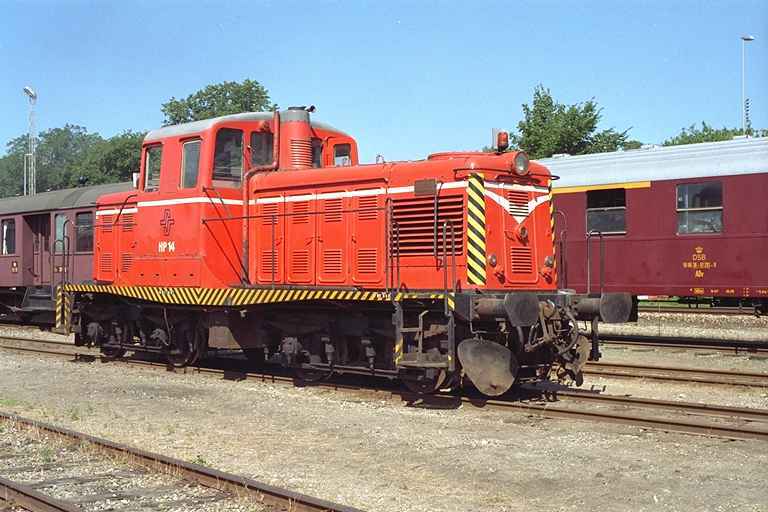 This is an old Nohab of the class MX built in 1961. 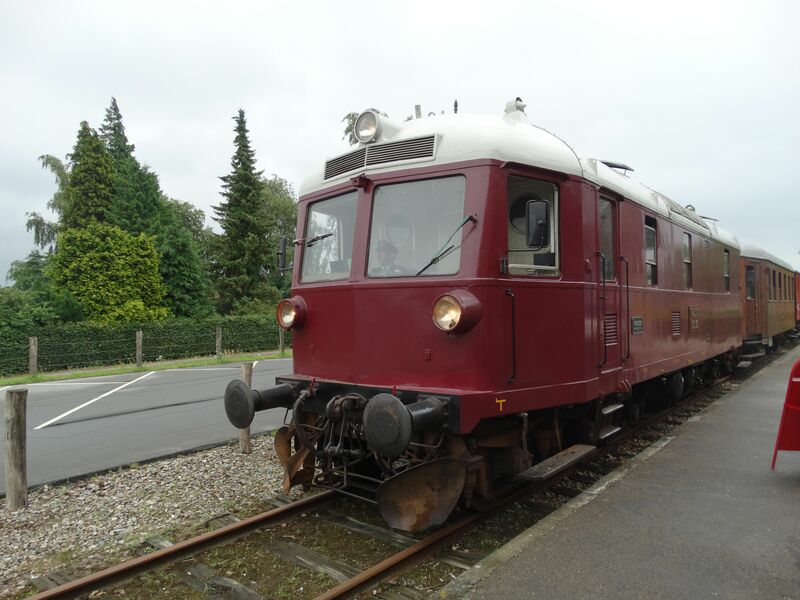 It was for quite some time owned by the private rail company �SJS as their MX no.41, but it was in 2007 bought by CFL, the state railways of Luxembourg. CFL uses it now to operate their own trains in Denmark. CFL is active in many other European countries in addition to its home country. 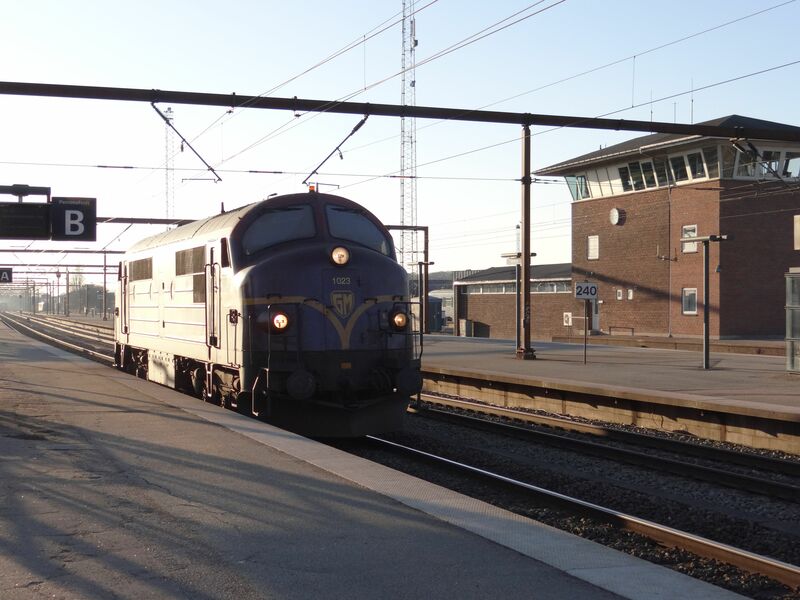 Here the locomotive is in full speed passing the train station of Odense on 13.3.2014. Picture by Ilkka Siissalo. 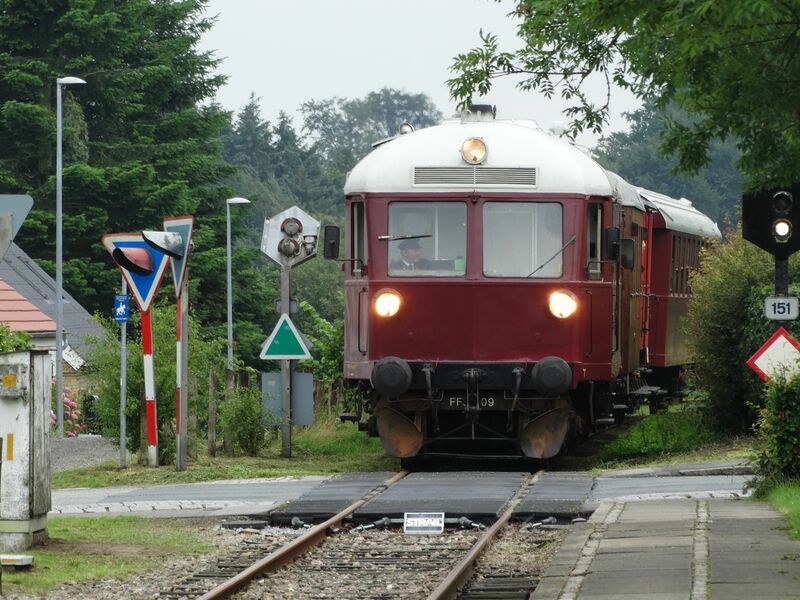 The German Siemens/D�wag type called Regiosprinter was designed as a diesel engine based "tram-train". Despite its modern technology, they never became a commercial success. The biggest users in Germany are/were Rurtalbahn and Vogtlandbahn and especially the last named company made real use of the models capabilities by operating these units as trams in the middle of cities and as diesel multiple unit trains elsewhere. Many of the German Regiosprinters have by 2016 now been sold to Austria. 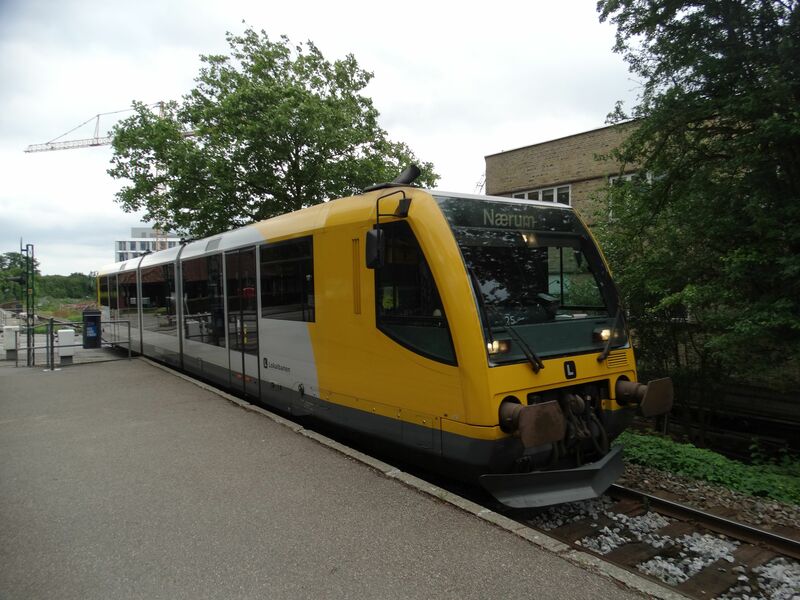 In Denmark the only user of the type is N�rumbanen (LNJ), which became a part of Lokalbanen AS. Since 2015 the company is called Lokaltog AS after yet further fusions. 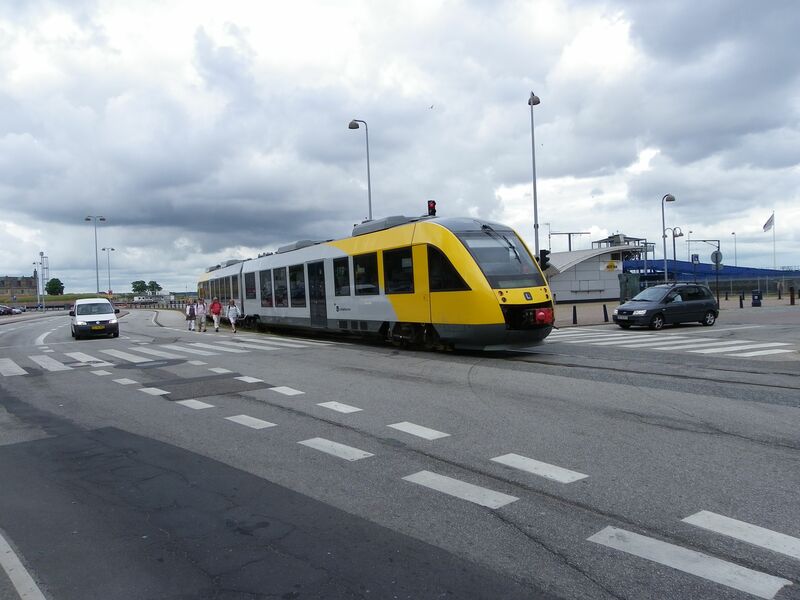 They operate a fast, tram-like light rail system in the suburbs of Copenhagen. This picture is from the train stop Lyngby lokal. Picture 10.7.2016 by Ilkka Siissalo. Another Regiosprinter arrived from the other direction to the train stop Lyngby lokal. Picture 10.7.2016 by Ilkka Siissalo. 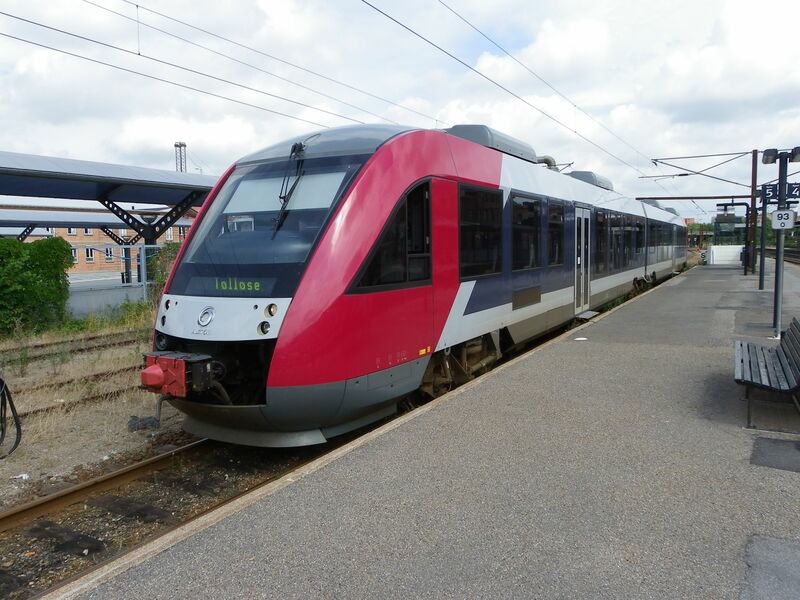 An Alstom Lint railbus at Helsing�r station, ready to leave towards Hiller�d. These modern railbuses replaced in many places in Denmark the 1960s Lynette railbuses which once were so omnipotent in all private rail traffic... Picture in Helsing�r 30.6.2010 by Ilkka Siissalo. ...And this was the view right behind the modern Lint railbus: Three DSB Lynette trains from the 1960s have been literally pushed aside to the bushes by the new Lints. The line from Helsing�r to Hiller�d was the only one where the state railways DSB used Lynettes, otherwise the Lynette trains were used only by the private rail companies - but all of them. 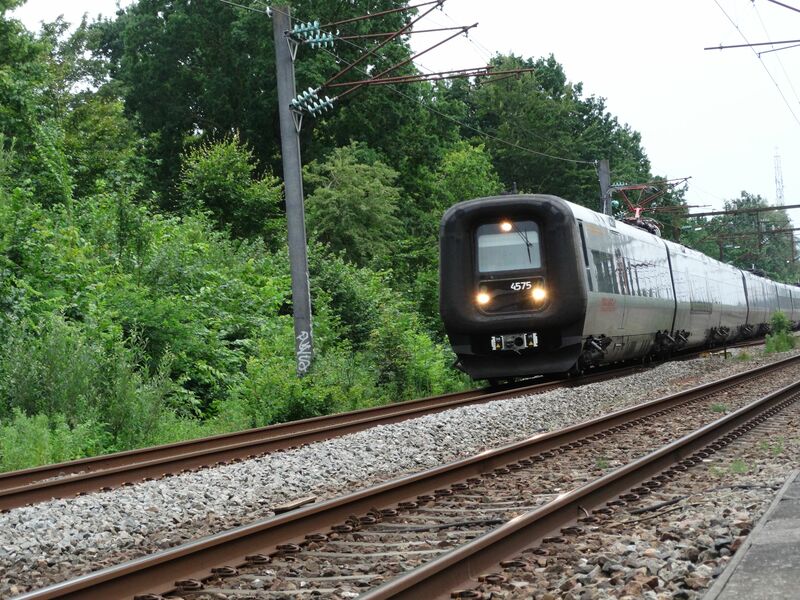 And now with their new trains the private company Lokalbanen pushed state DSB aside from the whole route. Picture in Helsing�r 30.6.2010 by Ilkka Siissalo. The private Lokalbanen Lint trains start their journey from the Helsing�r station towards Gilleleje and Hiller�d in the middle of normal road traffic... Picture in Helsing�r 30.6.2010 by Ilkka Siissalo. ... the only difference being that the trains do not have to stop at red traffic lights, but cars will have to give way instead. Picture in Helsing�r 30.6.2010 by Ilkka Siissalo. 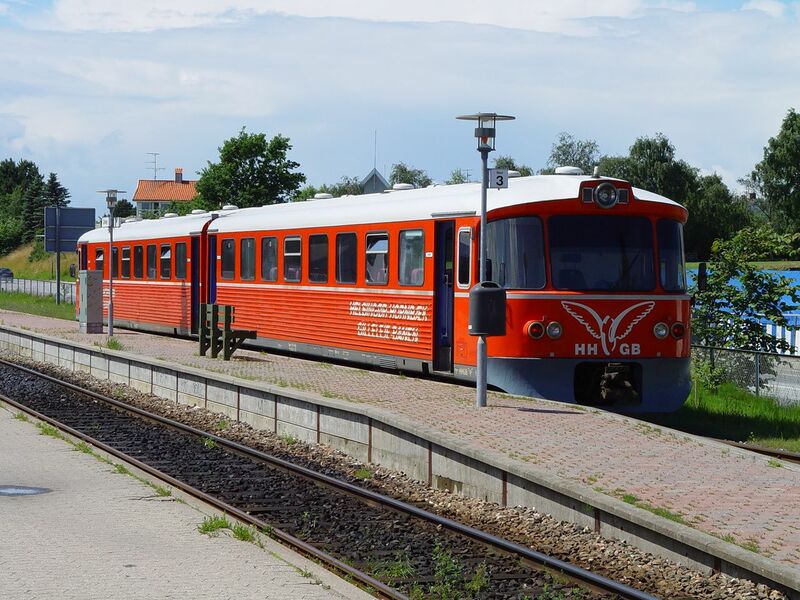 In 2004 the same route was still run by the 1960s Lynette trains and the rail company was called Helsing�r- Hornb�k-Gilleleje-Banen HHGB. That company later fused into Lokalbanen AS. Picture in Gilleleje 2.7.2004 by Ilkka Siissalo. Another view of the same Lynette. Picture in Gilleleje 2.7.2004 by Ilkka Siissalo. 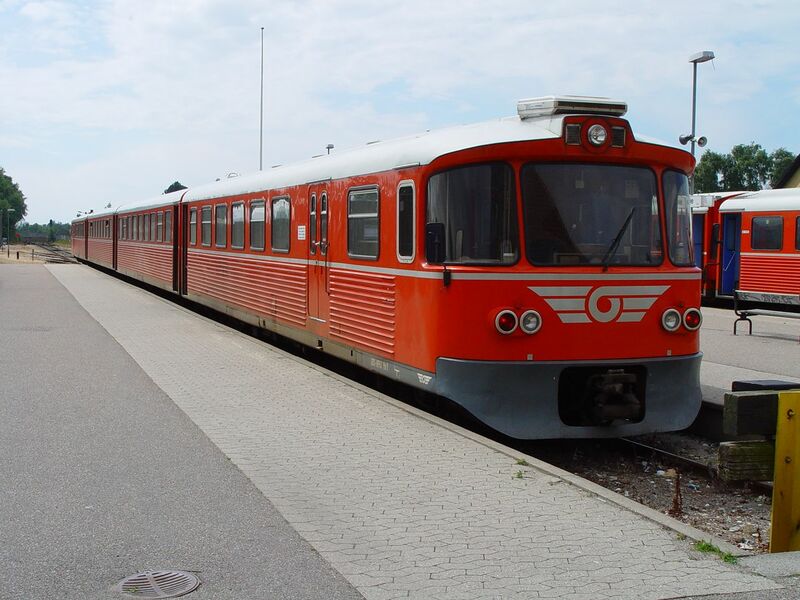 Two other private rail companies, Gribskovbanen and Hundested-Frederiksv�rk-Hiller�d banen first fusioned into GDS-HFHJ which then in turn became part of the present Lokalbanen. 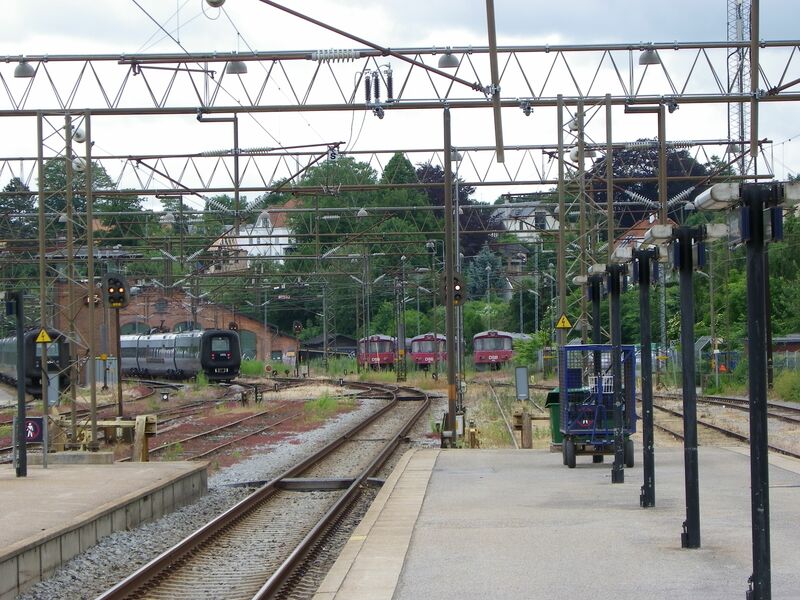 This picture from 2004 is from a time when Lokalbanen already existed but the trains still had old markings of the GDS-HFHJ. They were by then using four coach long Lynette trains on their service from Gilleleje to Gribskov. Picture in Gilleleje 2.7.2004 by Ilkka Siissalo. 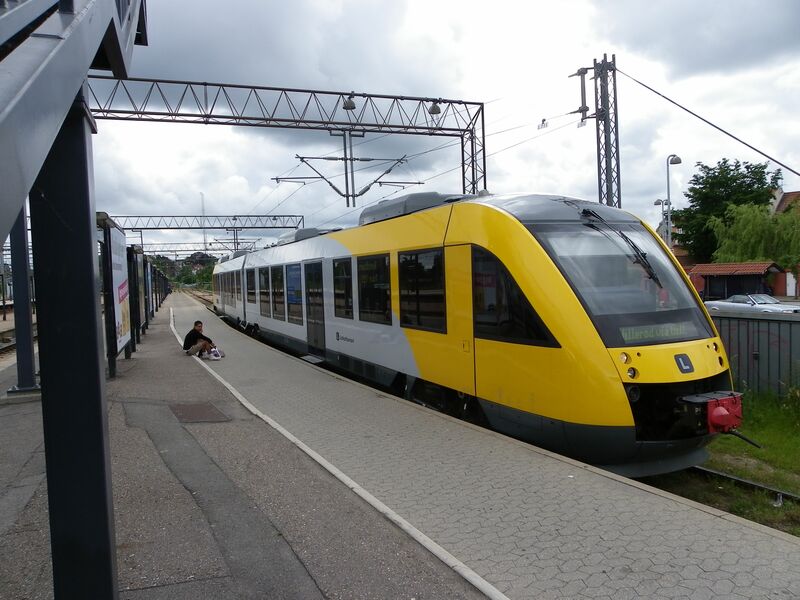 These almost new Siemens Desiro trains are operated by the Nordjyske Jernbaner in the very north of Jutland (Jylland) peninsula, here in service between Hj�rring and Hirtshals. Picture in Hj�rring 6.7.2016 by Ilkka Siissalo. 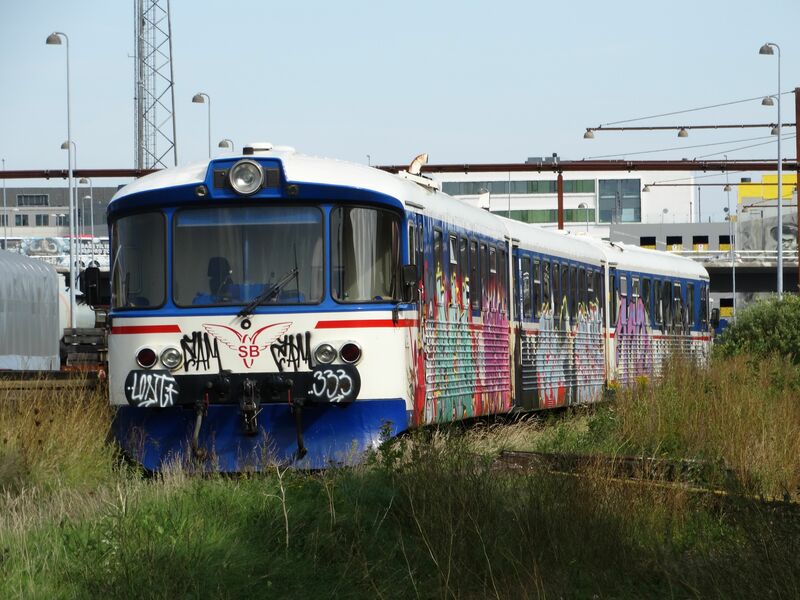 An old, valuable, museum railbus of the D�wag made type "Lynette", which was once used by all Danish private railroads, here in the paintings of SB or Skagensbanen, now a part of Nordjyske Jernbaner, left to the mercy of vandals at Aalborg. Picture in Aalborg 31.8.2016 by Ilkka Siissalo. 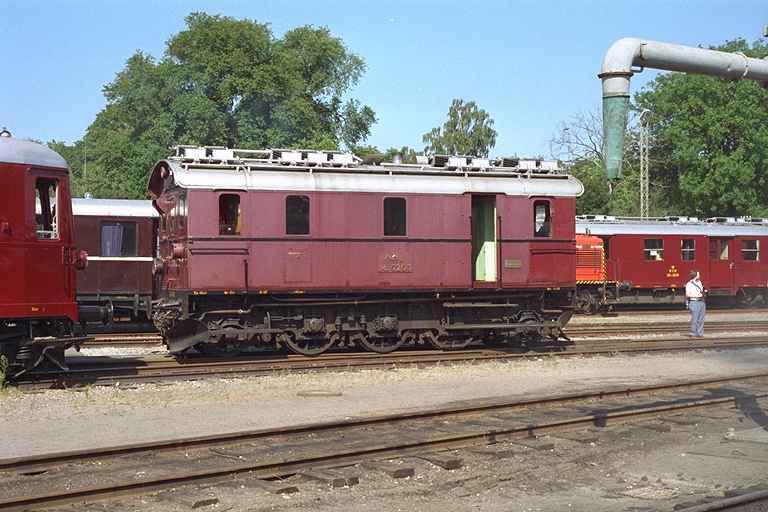 After the huge diesels and heavy M2 railcars, during 1960s to 1990s all traffic on most private railroads was taken care by the so called Lynette light railbuses. This is one car out of a three car Lynette set. During this period the train company at Odderbane had changed its name to Midtjyske Jernbaner. These red Lynettes were locally known by the nickname Oddergrisen, piglet of Odder. Picture at Horsens 8.7.2016 by Ilkka Siissalo. 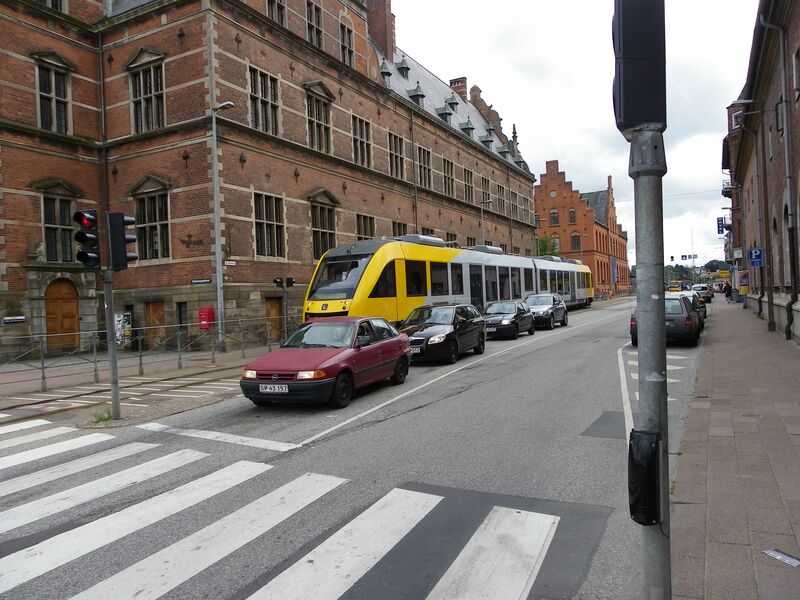 In 2012 the traffic on Odderbanen Odder-Aarhus became part of Aarhus N�rbane and the new operator became to be DSB. 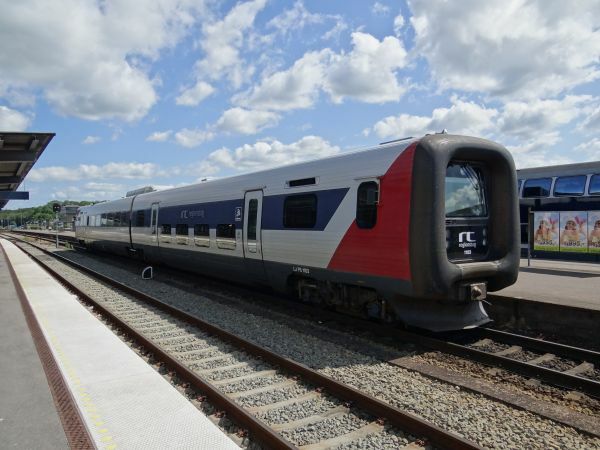 This is a DSB Desiro railbus, operating now in 2016 on the line. From beginning of 2017 however, there will again be a change. The line will be part of Aarhus Letbane, a light rail system running as a tram in city centers and as a train in the countryside. New rolling stock will be trams made by Stadler. Picture at Horsens 8.7.2016 by Ilkka Siissalo. 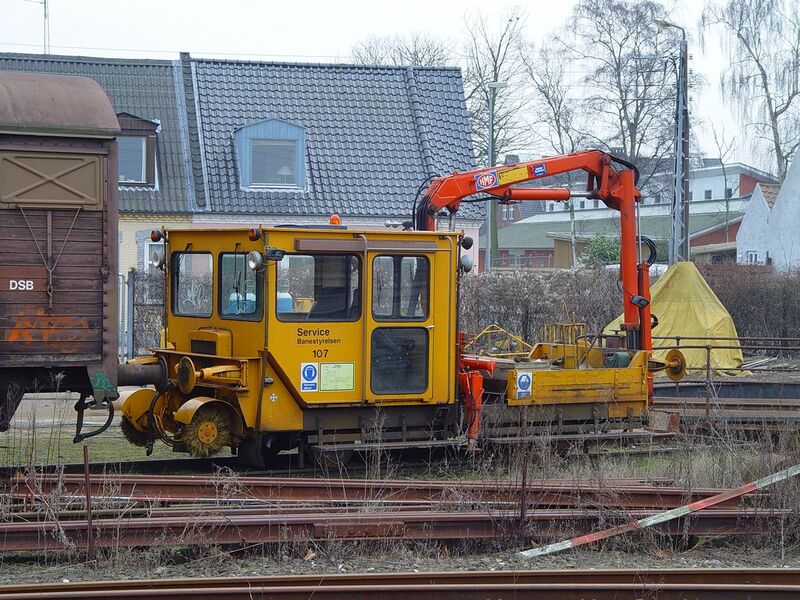 Although the operator is currently DSB, Midtjyske Jernbaner still takes care of the track maintenance. 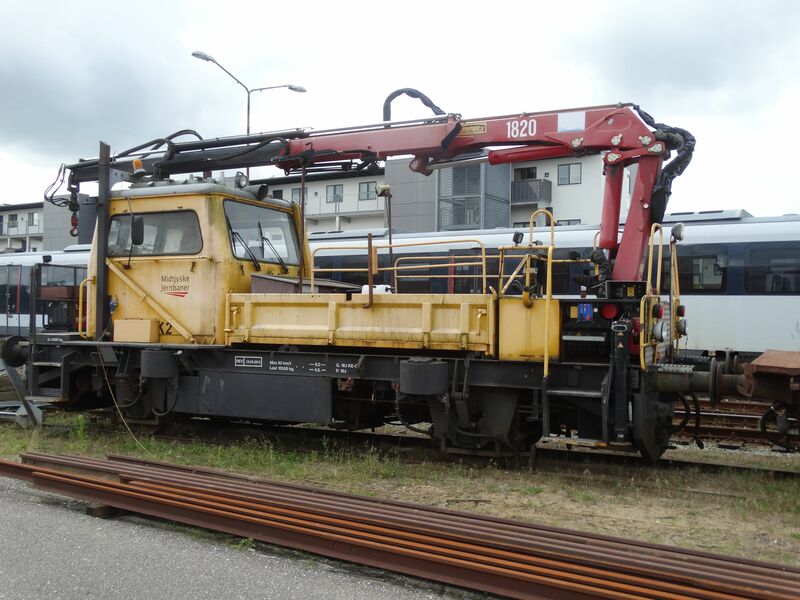 An MJ rail truck at Horsens 8.7.2016. Picture by Ilkka Siissalo. Poor old locomotive ! This class MY (Sweden: TMY) no. 1134 Nohab was built in 1957. We have followed its faith already earlier, as it can be seen in our category Sweden -> private operators' locomotives. Then, in 2009, it was still more or less in shape. 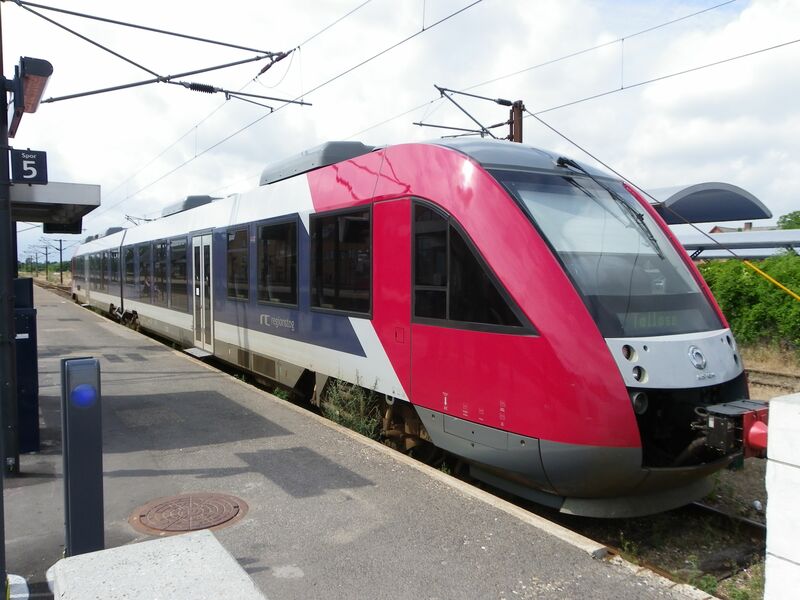 It was sold 2010 back to Denmark where it originated from, to Railcare Danmark, who then proceeded to rent it to Captrain, a French company. Here apparently it is back to Railcare, but in a desolate condition. Picture in Aalborg 31.8.2016 by Ilkka Siissalo. What used to be LJ Lollandsbanen, a private railroad between Nyk�bing (Falster) to Nakskov, is nowadays part of the RT Regionstog A/S. 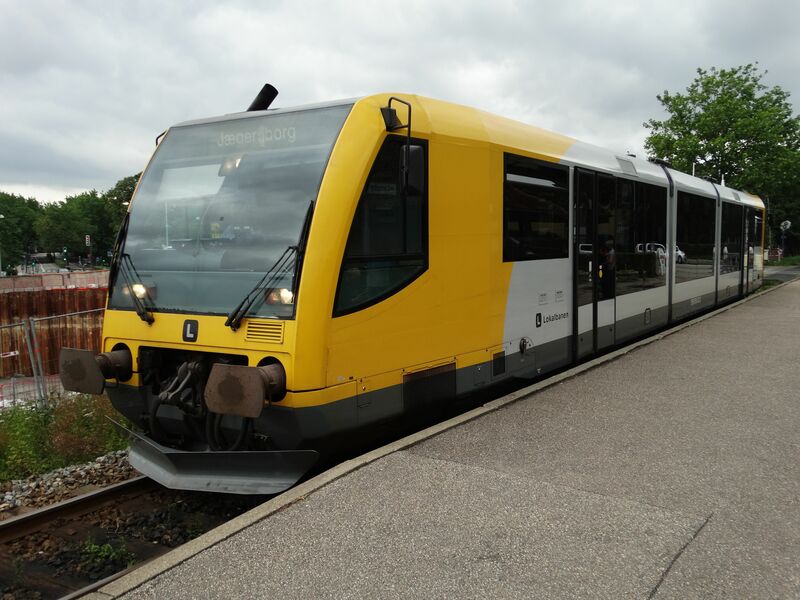 This is a Regionstog IC2 which has just stopped at the Maribo station and is now opening its doors while passengers are waiting. 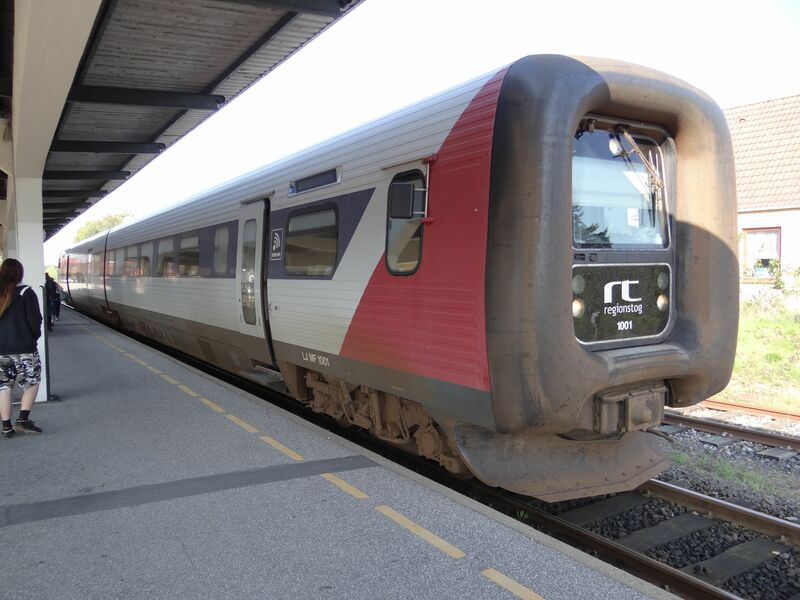 These "rubberface" trains are essentially the same as the ones used for example in Sweden in their "Kustpilen" service, but these also have a small low-floor section. (Note that DSB has in Demark also Italian built trains called IC2, but they have nothing to do with these private IC2s. Yes, it is confusing.) Picture at Maribo station 19.9.2014 by Ilkka Siissalo. 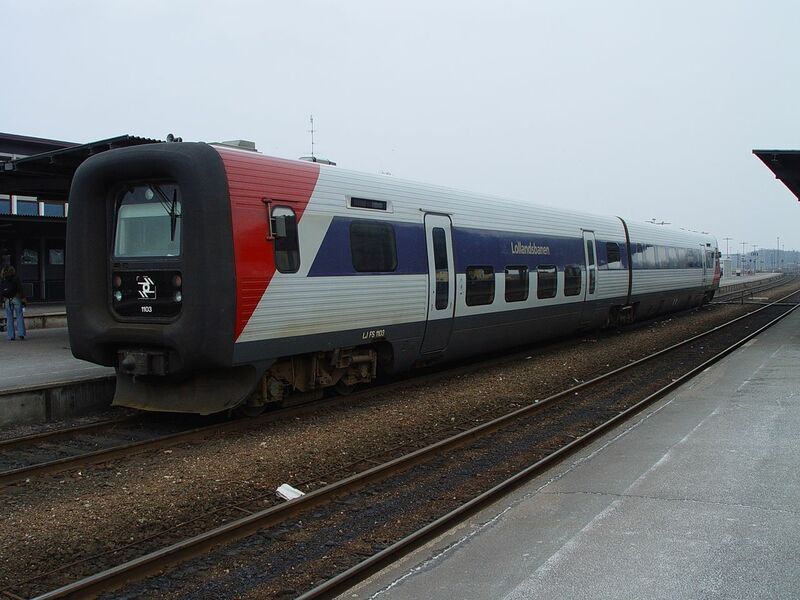 One of the same IC2 trains, but here still with the old Lollandsbanen logo in its front in 2003. Picture at Nyk�bing (Falster) station 2.3.2003 by Ilkka Siissalo. Same train as above, but seen from the other direction. Note the low-floor section. Picture at Nyk�bing (Falster) station 2.3.2003 by Ilkka Siissalo. An Alstom LINT diesel railbus of Regionstog at Kors�r station waiting to leave to T�ll�se. Picture in Kors�r 22.7.2010 by Ilkka Siissalo. Another view of the same LINT as above. Picture in Kors�r 22.7.2010 by Ilkka Siissalo. 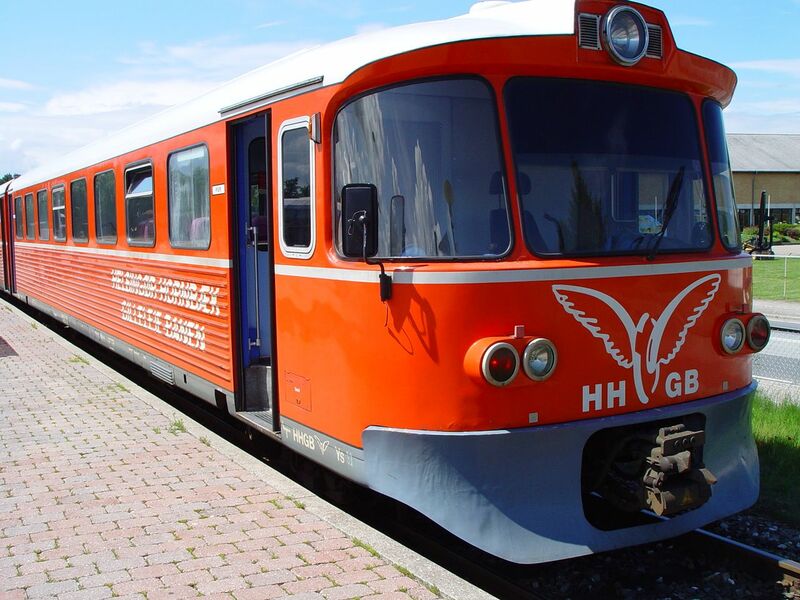 These were the trains used on the same line before the time of the LINTs shown above: An old two coach Lynette railbus still with the OHJ-HTJ stickers. The companies OHJ and HTJ merged in 2003. 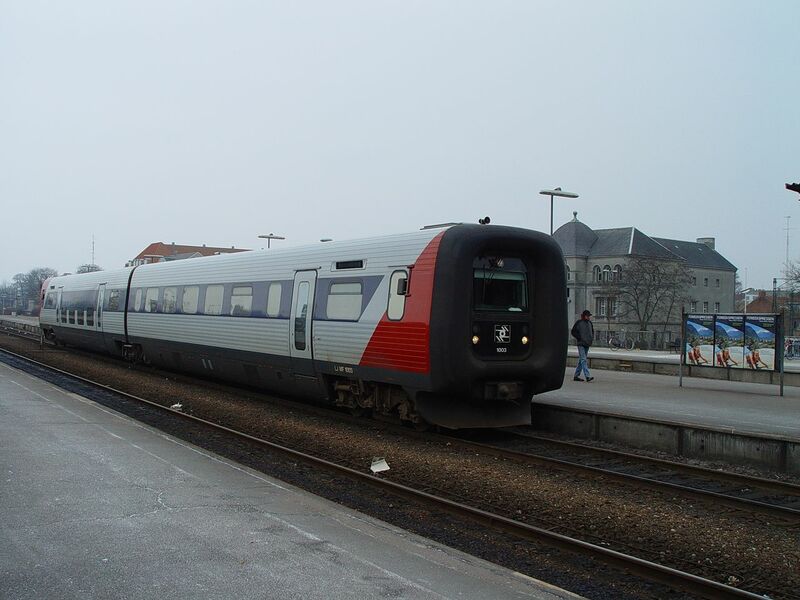 Then the new company OHJ HTJ merged in 2009 with Lollandsbanen A/S and �stbanen to become Regionstog which then in turn in 2015 merged with Lokalbanen AS to become Lokaltog AS. This picture is from 2004, so the company was still OHJ HTJ. Picture in Slagelse 2.7.2004 by Ilkka Siissalo. Rail truck MT 105 of Regionstog. Picture at Maribo station 19.9.2014 by Ilkka Siissalo. 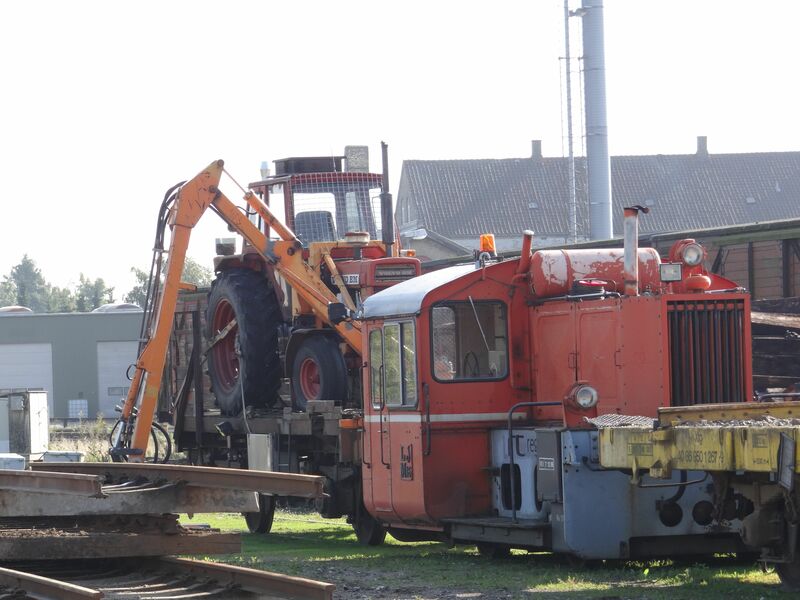 A rather strange combination of an old K�f II locomotive and a tractor fixed on top of a cargo wagon makes up for ad hoc machinery for exchanging rails. These are all Regionstog's equipment. Picture at Maribo station 19.9.2014 by Ilkka Siissalo. 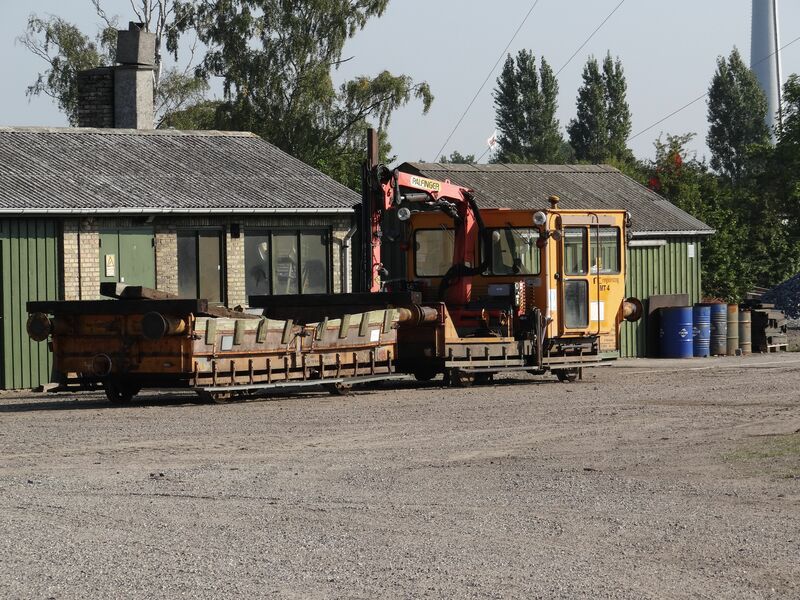 A bit more modern rail truck of Regionstog, this MT 4 was used for picking up old rotten sleepers and transporting them away. Picture at Maribo station 19.9.2014 by Ilkka Siissalo. This luxurious Pontiac rail car of Skagensbanen was intended for the use of Skagensbanen's top management. Train photographer Sanna Siissalo is admiring the car, which is from the year 1934. Skagensbanen bought it in 1944. During the period of the Nazi German invasion, no gasoline was available and during that time the car was fitted with a wood gas generator. 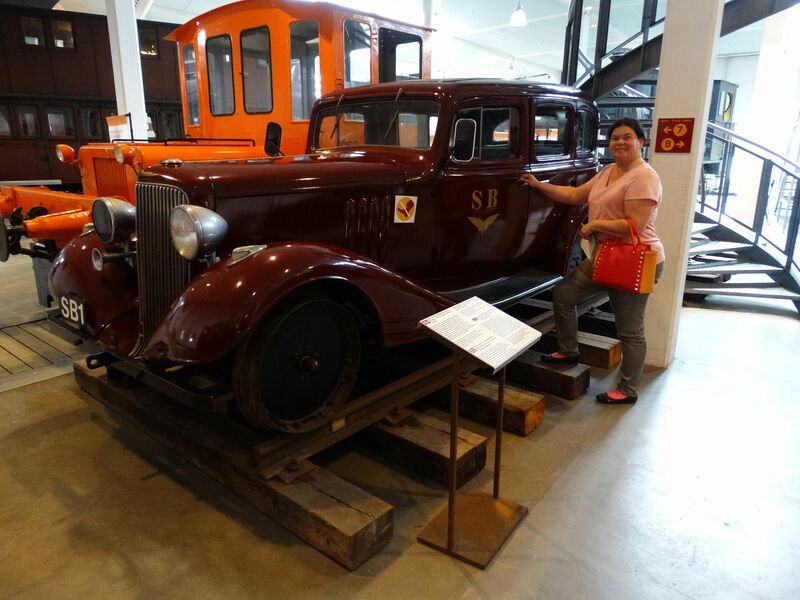 Picture at the Danish national railway museum in Odense 10.7.2016 by Ilkka Siissalo. 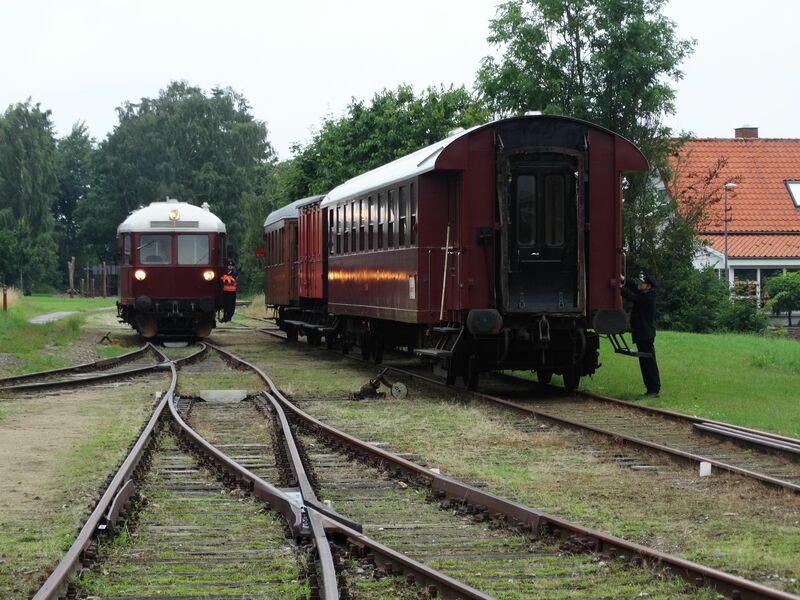 The Syd Fyenske Veteranjernbane is an association, which during summer weekends operates museum trains on the Faaborg - Korinth line. The trains consist of rolling stock from both DSB and from various former private rail companies. The Syd Fyenske Veteranjernbaner train is approaching Korinth station 10.7.2016. Picture by Ilkka Siissalo. ... and then it stops at the Korinth station. 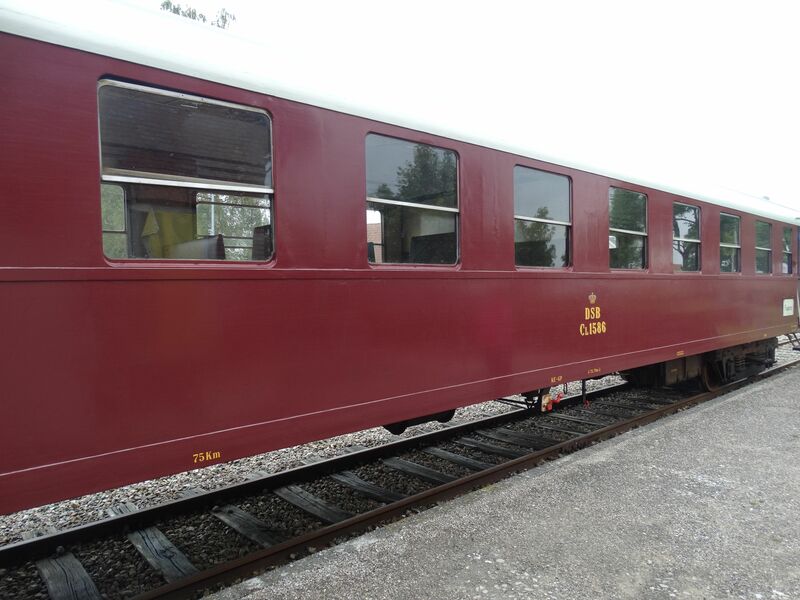 A pure 1050s private train. Picture 10.7.2016 in Korinth by Ilkka Siissalo. 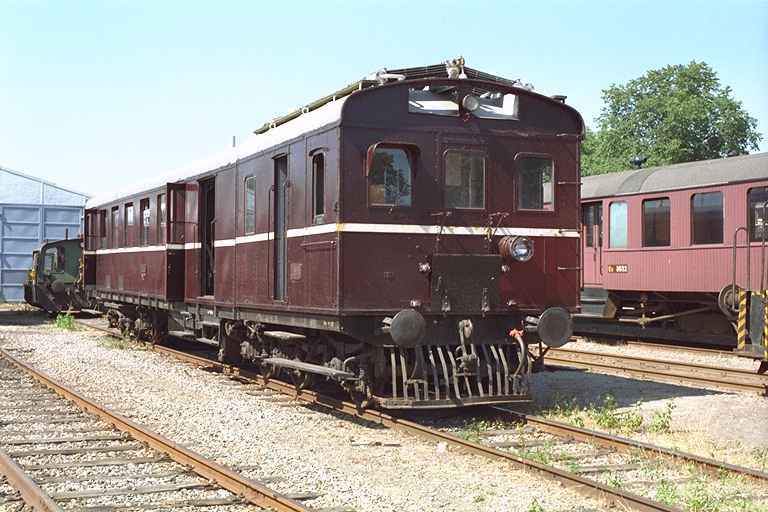 The impressive 6 axle locomotive class ML no.12 made by Frichs was earlier used as a type by several private railroads before the time of the cheap and lightweight Lynette railbuses. This one used to belong to VLTJ or Lemvigbanen, later part of the Midtjyske Jernbaner. Picture 10.7.2016 in Korinth by Ilkka Siissalo. 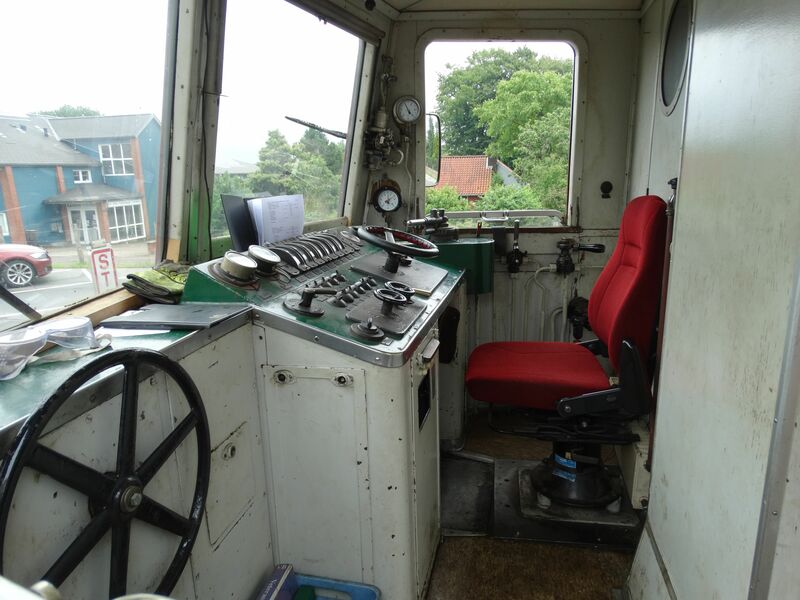 Driver's cab of the old Frichs class ML locomotive. It's all old, except for the driver's chair. Picture 10.7.2016 in Korinth by Ilkka Siissalo. 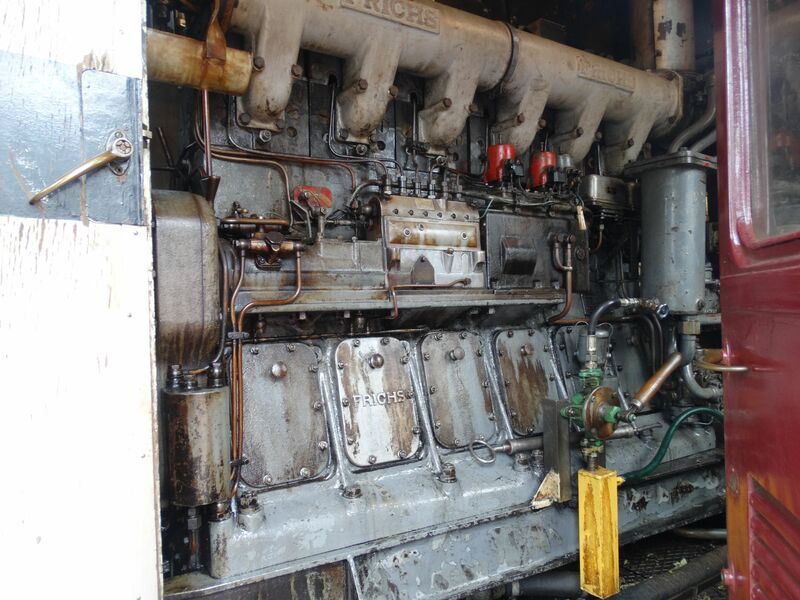 The mighty and noisy old diesel engine of the class ML locomotive. Picture 10.7.2016 in Korinth by Ilkka Siissalo. This old teakwood coach originates from the company HTJ, H�ng - T�ll�se Jernbane. Picture 10.7.2016 in Korinth by Ilkka Siissalo. 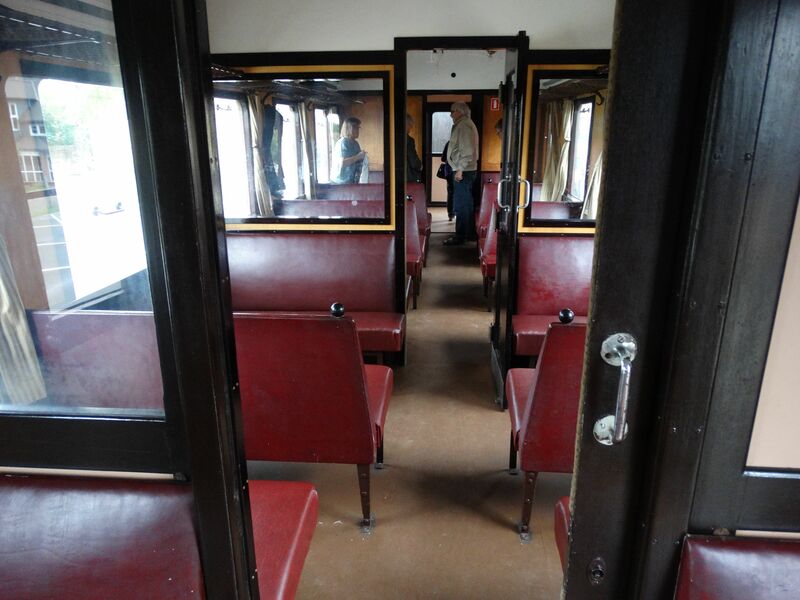 Inside view of the old HTJ, H�ng - T�ll�se Jernbane, wagon. Picture 10.7.2016 in Korinth by Ilkka Siissalo. 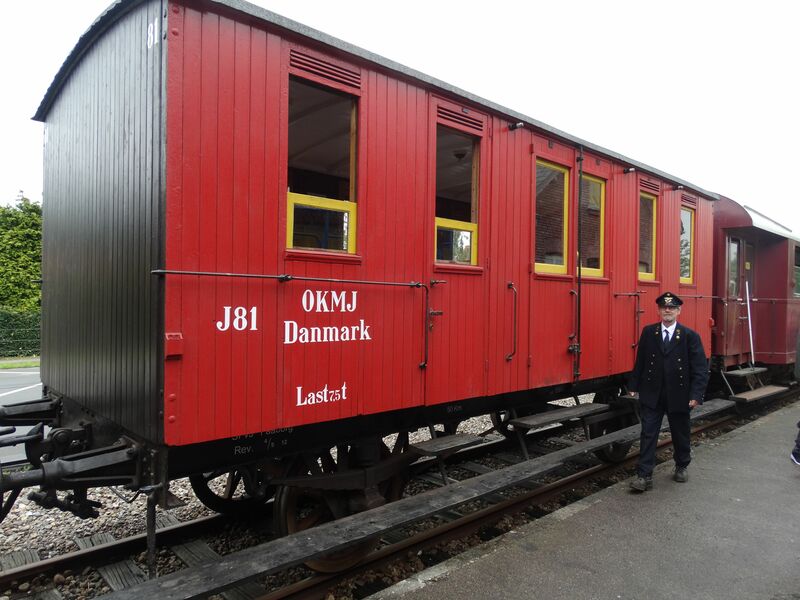 This old wagon of the museum train originates from OKMJ, Odense-Kerteminde-Martofte Jernbane. Picture 10.7.2016 in Korinth by Ilkka Siissalo. 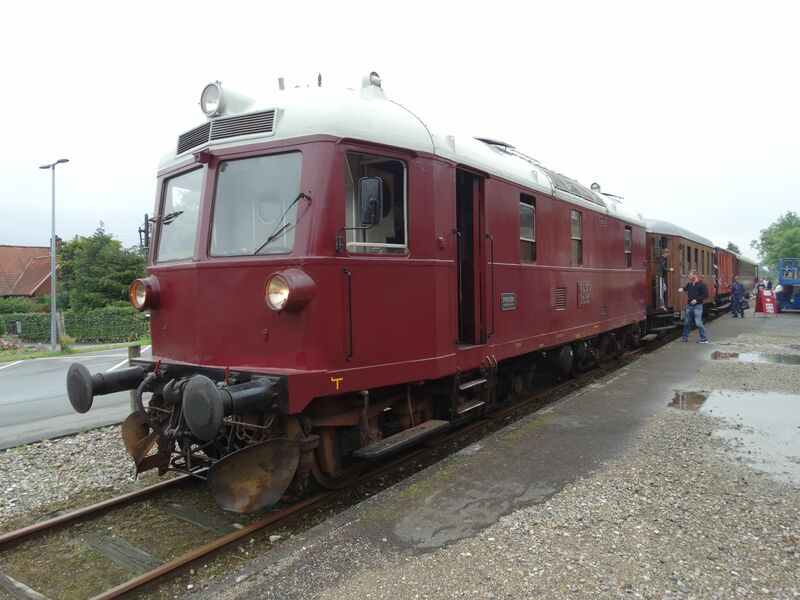 And last but not least, the train consisted of also one DSB coach of the class CL. 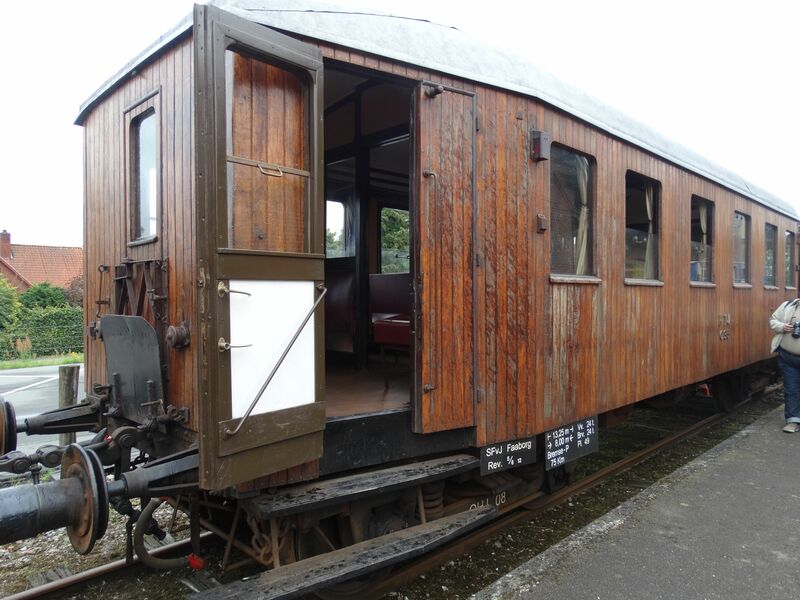 It looks almost new, but the bogies are taken from a much, much older coach and date back to the year 1839. Picture 10.7.2016 in Korinth by Ilkka Siissalo. Here is still once more the whole museum train, while the locomotive was being moved to the other end. Picture 10.7.2016 in Korinth by Ilkka Siissalo. 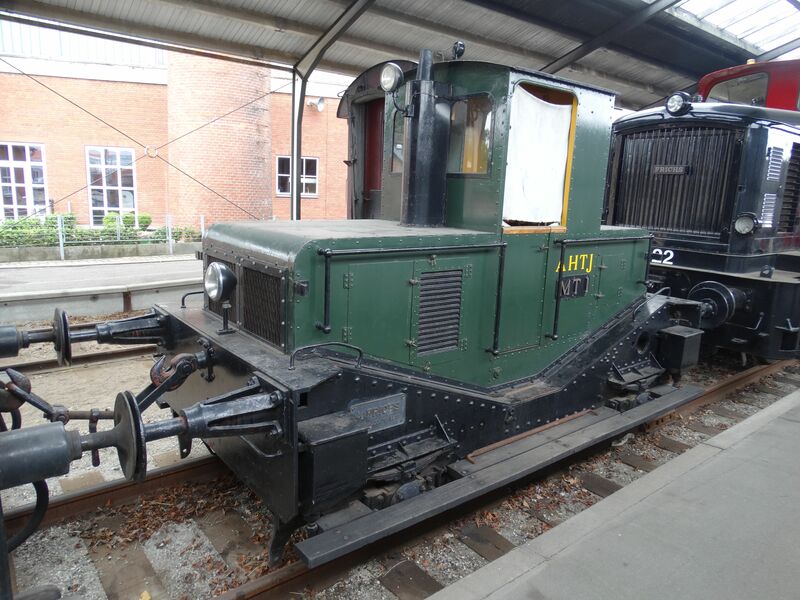 This �HTJ rail tractor was built by Frichs in 1933. It had a Frichs six cylinder diesel engine. 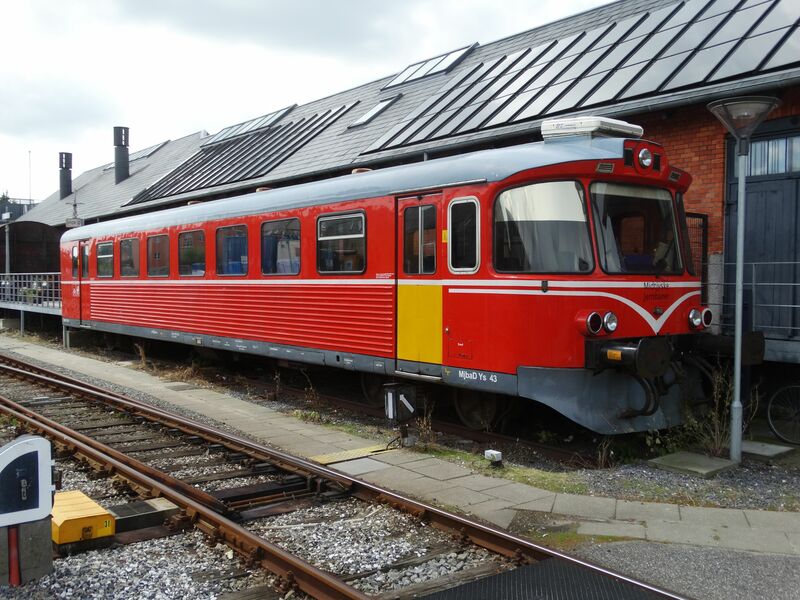 It changed ownership several times and was finally delivered to the national railway museum in Odense in 2005, where this picture was taken 10.7.2016 by Ilkka Siissalo. 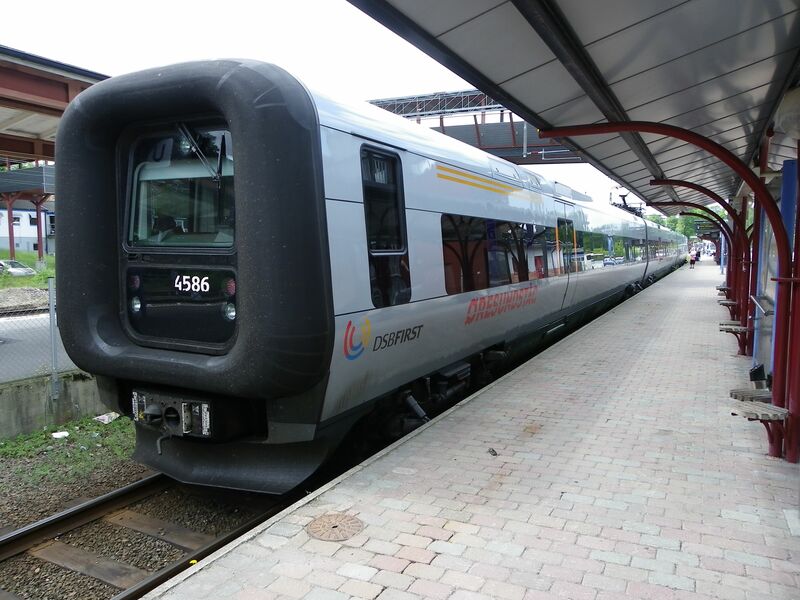 After the �resund bridge and tunnel created a fixed rail connection between Denmark and Sweden, a joint venture company, DSBFirst, was set up. Danish state DSB owned a part of it and the First bank a part. First bank later backed out of the operations, which are now run by DSB �resund and Transdev. 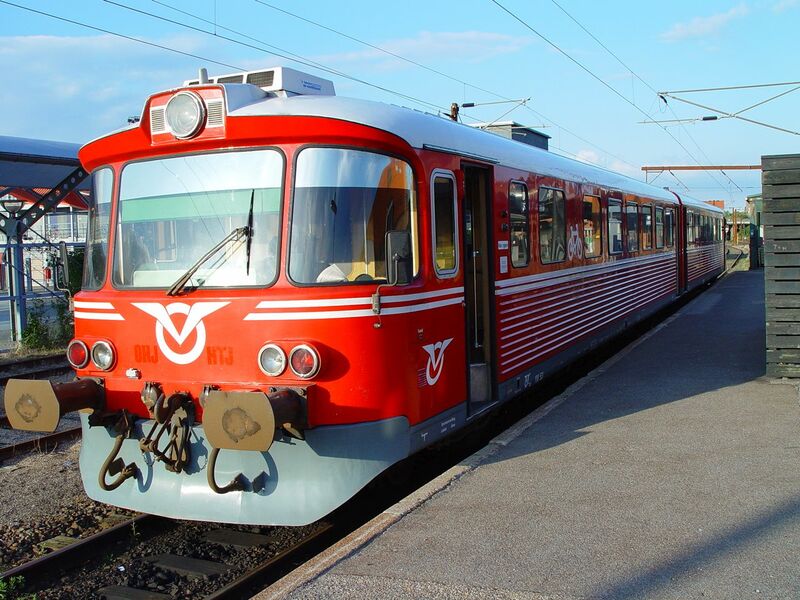 �resundst�g operates with electric "rubberface" trains known as IC3, in Sweden X31. 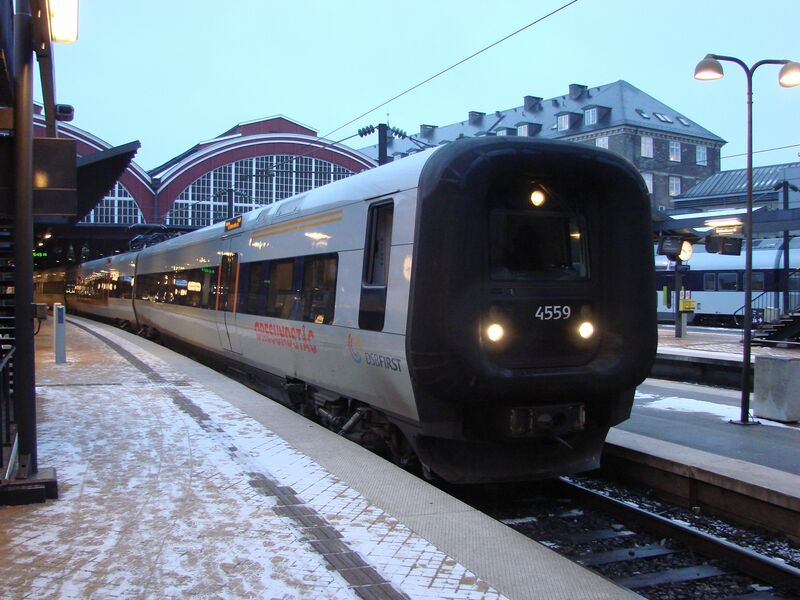 Picture of an �resund train at Copenhagen central station 12.1.2010 by Ilkka Siissalo. 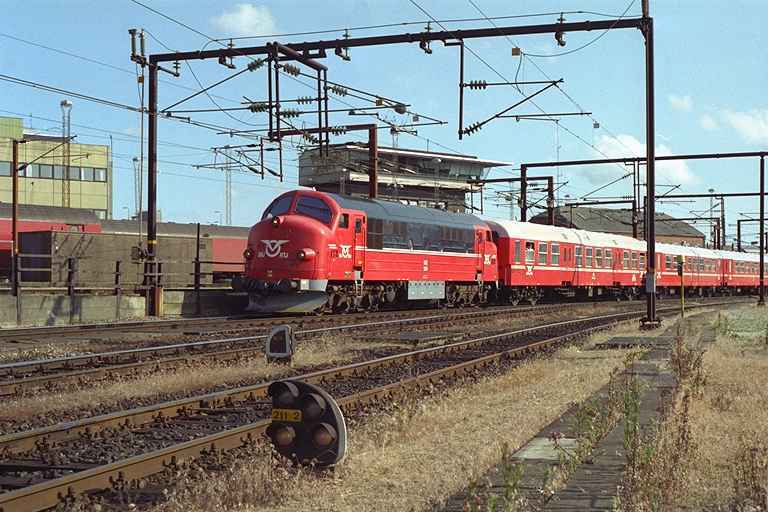 One of the �resundst�g units in full speed at Niv�, north of Copenhagen. Picture 10.7.2016 by Ilkka Siissalo. 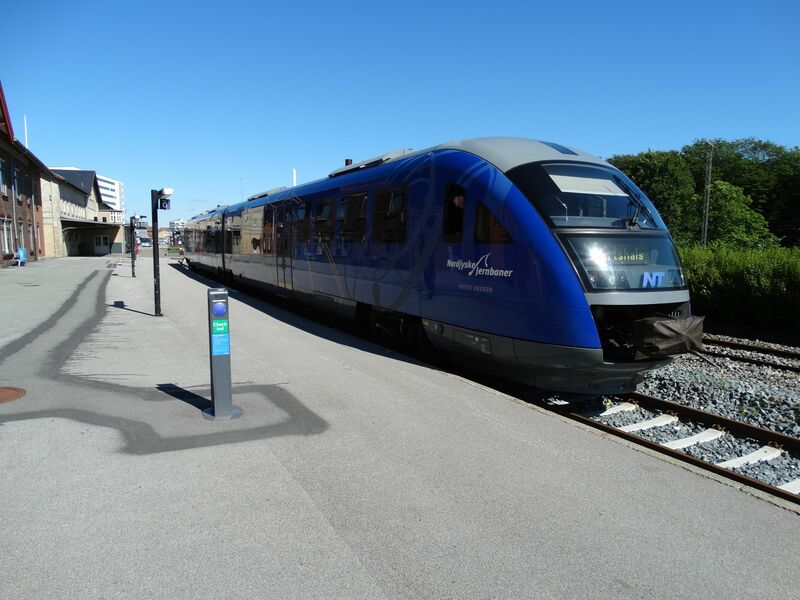 One of the �resundst�g units in V�xj�, Sweden. Picture 30.6.2010 by Ilkka Siissalo.